It doesn't look like Florida will be losing its status as one of the most competitive states in the country at the Presidential level next year- voters in the state are almost evenly divided on Barack Obama's job performance and although he leads all six of the Republicans we tested him against, some of the margins are quite close. 48% of Florida voters approve of the job Obama's doing to 47% who disapprove. His numbers break down predictably- 81% of Democrats like him, Republicans dislike him at an even higher rate of 85%, and allowing him to have slightly positive overall numbers is that he's on positive ground with independents at 49/44. Two potential Republican opponents- one quite plausible and the other a long shot- would start out virtually tied with the President. Mitt Romney does the best, trailing Obama 46-44. Given that there are two undecided Republicans for every Democrat in that match up you're basically looking at an even match. It's a sign of Romney's appeal in the Sunshine State that he actually does a hair better than former Florida Governor Jeb Bush, who trails Obama 48-45 in the state. Obama would start out in a slightly healthier position against four other Republicans we tested. He leads Rudy Giuliani by 6 points at 48-42, Mike Huckabee by 7 at 50-43, Newt Gingrich by 8 at 50-42, and Sarah Palin by 13 at 52-39. When it comes to the favorability numbers on the Republicans the figures for Giuliani might be most interesting. Only 37% of voters rate him favorably to 46% with a negative opinion. There's been a lot of ink about whether he could muster the appeal to the GOP base to be a viable wild card candidate for the nomination but these numbers suggest his appeal has slipped quite a bit with the electorate as a whole too. Three of the Republicans we looked at pretty much broke even on their favorability scores- Huckabee came out slightly ahead at 40/39, Romney's at 39/39, and Bush is at 44/44. Florida voters have a much more charitable view of Romney and Huckabee than ones in other swing states like Ohio and Virginia- that could actually lead to Florida being less important than it has been in other recent elections because if Obama's winning in those kinds of places he doesn't really need Florida for any purpose other than building up the size of his victory. The race to replace Haley Barbour as Governor of Mississippi this fall doesn't appear to have much potential for competitiveness. The presumptive Republican nominee, Lieutenant Governor Phil Bryant, has leads of 26-31 points over his two most likely Democratic opponents. The one reason to think the dynamic of the race could potentially change between now and the fall is that none of the candidates, even Bryant himself, is terribly well known. He is the only candidate with greater than 50% name recognition and the only one with positive favorability numbers, at 32/27. Democratic Hattiesburg Mayor Johnny DuPree has the next highest profile at 39% with an opinion about him, followed by fellow Democrat Bill Luckett and Republican Dave Dennis at 35%, and Republican Hudson Holliday at 31%. It's conceivable that one of these folks could catch fire as their profile increases and they become better known but there's nothing to suggest that will happen based on their current numbers- each has at least 9% more voters with an unfavorable opinion of them than a positive one. Bryant leads Luckett 53-27 and is up 56-25 on DuPree. He has his party unified around him in both match ups (84-4 over DuPree and 82-3 over Luckett with Republicans) but what really drives his large margins is the numbers with Democrats and independents. He's holding Luckett to only 55% of the Democratic vote and DuPree to an even lower 49%. That's partially because there are a lot of undecideds but Bryant is also outright taking 23-28% of the Democratic vote. Perhaps the most telling finding on the poll when it comes to the future viability of the Democratic Party in Mississippi is that white Democrats actually plan to vote for Bryant over their party's candidates- 44-26 over DuPree and 43-33 over Luckett. One thing that would need to happen for Democrats to win a major race in Mississippi is for the party to have candidates who are at least in good standing with the party's own voters- that is not the case here. DuPree's favorability even with Democratic voters comes down at 21/32 and Luckett's is not much better at 18/27. The race gets a little bit closer if one of the lesser Republican candidates were somehow to snag the nomination, but not that close. Dennis leads Luckett by 18 points at 43-25 and DuPree by 13 points at 41-28. Holliday leads Luckett by 10 points at 38-28 and DuPree by 9 points at 37-28. This is our first poll of the Mississippi Governor's race and at this level of competitiveness it may well be our last too. The winners of our vote on where to poll this week were Georgia and New Hampshire. There was rampant cheating on the vote and near as we could tell those were the states that got the most unique individual votes. If anyone has suggestions on some better, free polling service we could use that could keep people from gaming these polls I'd appreciate it, otherwise we may just stop doing them because it's not worth the energy. In New Hampshire we'd love suggestions of who to test against John Lynch for reelection next year and anything else you think we should ask. Georgia in particular we'll have a lot of room for your question ideas without either a Senate or Gubernatorial race for next year to look at so please tell us what you'd be interested to see. Not going to get around to releasing our Mississippi Governor numbers today so those will be out tomorrow along with the Florida President ones. Bill Nelson continues to have approval numbers that leave something to be desired...but he also has at least a 13 point lead over all of his prospective opponents for next year and against the nominal Republican front runner at this point, Mike Haridopolos, he's already hit 50%. 38% of voters approve of the job Nelson's doing to 34% who disapprove. Those numbers sound uninspiring but the main reason for them is that only 55% of Democrats approve of the job he's doing, where you'd usually expect someone to be in the 70-80% range within their own party. Nelson gets 74-80% of the Democratic vote against each of the Republicans we tested him against so this is a classic case where his base might not love him, but they're still going to vote for him. While Nelson doesn't generate much enthusiasm from within his own party, he's also not much of a turn off to Republicans. An unusually high 21% of them approve of the job he's doing and he gets as much as 19% of the GOP vote in the head to heads against named Republicans. Most of the time people focus on politicians' approval number when analyzing their reelection chances and if you do that in Nelson's case 38% doesn't look so hot. I think it might be more instructive here though to look at Nelson's disapproval number- is someone who only 34% of voters are unhappy with really going to get tossed out of office? Seems doubtful- certainly didn't happen to any Senators or Governors last year. The Republicans who poll strongest against Nelson aren't going to run. Connie Mack IV, who announced he wouldn't seek the office after we'd already started the poll, trailed Nelson by 13 points at 47-34. Another incredibly long shot candidate, MSNBC host and former Congressman Joe Scarborough, trails by 13 points as well at 45-32. Among the more plausible candidates former Senator George LeMieux does best but still trails by 15 points at 48-33. Mike Haridopolos and Adam Hasner trail by 16 points at 50-34 and 48-32 respectively, and Wikipedia founder Jimmy Wales does the worst with a 19 point deficit at 47-28. None of the Republican hopefuls are particularly well known at this point so it's likely they would make up some ground were any of them to become the nominee. Only 35% of voters know enough about Scarborough to have an opinion and that drops to 32% for Haridopolos, 31% for LeMieux, 23% for Hasner, and 17% for Wales. With double digit leads over all of his prospective opponents and few voters who dislike him, I think there's a pretty good chance Nelson's vulnerability has been strongly overrated. Mitt Romney leads the Republican field for President in Michigan...but the numbers suggest a fair amount of slippage from his support in the state in 2008. 26% of GOP primary voters say Romney's their first pick followed by 20% for Mike Huckabee, 15% for Newt Gingrich, 12% for Sarah Palin, 7% for Ron Paul, 5% for Mitch Daniels, and 3% for Tim Pawlenty and Scott Walker. On the surface Romney's lead is good news for him. But in 2008 he took 39% in the primary in the state while Huckabee got only 16%. So compared to then Romney is down by 13 points while Huckabee's improved by four. That sort of trend in Romney's numbers compared to the support he got in his first bid is becoming common place in our polls. Romney's weakness continues to be with voters who describe themsevlves as 'very conservative.' With moderates he gets a strong 39% and with 'somewhat conservative' voters he's at a respectable 28%. But with 'very conservative' folks he just ties Huckabee at 20%. More over his favorability with them is only 63% compared to 83% for Palin, 71% for Huckabee, and even 65% for Gingrich. Romney's weak standing with the far right is his greatest hurdle to potentially winning the nomination. Pete Hoekstra is the clear first choice of Republicans in the state for who they'd like as their nominee to take on Debbie Stabenow next year. 38% say he'd be their pick compared to 18% for Terri Lynn Land. No one else cracks double digits, with Saul Anuzis at 5%, Justin Amash, Randy Hekman, and Tim Walberg at 4%, Chad Dewey at 3%, and Tim Leuliette with the big egg at 0%. Hoekstra and Land actually have identical 53/10 favorability ratings with GOP voters but there's a much stronger sentiment for Hoekstra to actually be the candidate. Haley Barbour's a popular Governor...but Mississippi voters don't want him to run for President and Mike Huckabee fares better than him against Barack Obama on his home turf. 52% of voters in the state approve of the job Barbour's doing to 39% who disapprove. Republicans are pretty universal in their happiness with his work (83%), he's got a majority of independents behind him (53/42), and he has a decent amount of crossover approval from Democrats (19%). There's a massive racial divide in Barbour's approval numbers with 72% of whites but only 14% of African Americans approving of him. Barbour is more popular with whites than any current Governor in the country that we've polled on. For all of that though Mississippi voters aren't terribly enthused about the possibility of a Barbour White House bid. Only 33% want him to run for President, compared to 48% who express opposition to a candidacy and 19% who express no opinion. 54% of GOP voters want Barbour to go for it, but Democrats (76%) are more unified in their desire for Barbour not to run and independents split pretty evenly. Regardless of who the Republican nominee for President is next year it appears the state will remain in the GOP column. Barack Obama is not popular, with only 42% of voters approving of him to 54% who disapprove. Although he's in good standing with blacks at 93% approval, just 16% of whites think he's doing a good job. Obama trails all of the Republicans we tested against him- he trails Sarah Palin by 4 points at 48-44, Newt Gingrich by 6 points at 48-42, Mitt Romney by 6 points at 46-40, and Barbour by 10 points at 51-41. Huckabee does the best, leading Obama 54-40. Huckabee and Barbour post nearly identical numbers against Obama among Democratic and Republican voters, but with independents Huckabee leads the President by 24 while Barbour has only an 11 point advantage. There are a couple of interesting things within the favorability numbers for the Republican candidates. The first is that even though she leads Obama, Palin comes down at 42% of voters with a positive opinion of her to 50% with a negative one. That makes 28 states out of 28 where PPP has polled on her that Palin's in the red. Also interesting is that Romney's favorability rating with Republican voters is just a paltry 43%. That portends trouble for him in the South and in states where the Republican electorate is particularly conservative- it's not just that these folks like Barbour, Huckabee, and Gingrich better, it's that they don't really like Romney at all. At any rate even if next year's contest proves to be a landslide of massive proportions for Obama it still doesn't look like he has a very good chance of adding Mississippi to his column. While Rick Scott's off to a terrible start as Governor, Marco Rubio's initial approval numbers after nearly three months in the Senate are looking good. 43% of voters give him good marks for his work so far to 31% who disapprove. That already makes him the state's more popular Senator- numbers on Bill Nelson that we'll release tomorrow show him with a 38/34 approval rating. Rubio's managed to keep strong support from within his own party without antagonizing voters across party lines too, too much. 70% of Republicans approve of him to 10% who disapprove. He doesn't have a ton of support from Democrats- only 17% approval- but he hasn't turned them against him on a broad scale either. Only 51% of them disapprove of him, compared to 81% for Rick Scott. That suggests they're at least giving him a chance. And he's on positive ground with independents at 44/31. Our average approval rating for a US Senator in the second half of 2010 came out to a +3 spread. Rubio's +12 to date puts him well ahead of the curve. We also took a look at how Floridians feel about Charlie Crist several months after he left office. 46% of them have a favorable opinion of him while 42% rate him negatively. Democrats like him (59/28), Republicans don't (33/57), and independents are split right down the middle (44/44). If he was ever to run for office again 39% of voters think he should do it as a Democrat, 36% think he should do it as an independent, and only 12% think he should do it as a Republican. It's very clear that Crist has no home in the Republican Party- only 19% of GOP voters say they would want him to run as one of their own. What might be most interesting is the ideology numbers on Crist's future party. Voters describing themselves as 'very liberal' think Crist should be a Democrat, as do voters describing themselves as 'very conservative.' Moderates and voters identifying just as 'somewhat' liberal or conservative think Crist should stay in the independent ranks. It's pretty unusual for us to find the far left and the far right in agreement on anything with folks in the middle taking a different view but Crist has had a consistent ability for better or worse to defy all political norms. You could say Rick Scott's honeymoon is over...but that would suggest he had one in the first place. A December PPP poll shortly before Scott took office found that only 33% of Florida voters had a favorable opinion of their new Governor to 43% who viewed him negatively. After a few months in office those numbers have only gotten worse- Scott's approval rating is just 32% while 55% of voters in the state are unhappy with his work so far. Scott's numbers leave a lot to be desired across the political spectrum. Only 57% of Republicans approve of the job he's doing to 27% who disapprove. To put those numbers into some context his counterparts in the Midwest who are having their own popularity problems at least are doing far better within their own parties- Wisconsin's Scott Walker stands at 86% with Republicans, Ohio's John Kasich is at 71%, and Michigan's Rick Snyder has a 68% approval with GOP voters. Outside of his own party Scott's support is close to nonexistent. Only 31% of independents like what he's done so far to 54% who disapprove. And with Democrats his approval is just 11% to 81% who disapprove. For sake of comparison Marco Rubio's disapproval with Democrats is only 51%, 30 points lower than Scott's and his disapproval with independents is only 31%, 23 points lower than Scott's. The Florida Governor's race was one of the closest in the country last year with Scott winning by a razor thin margin even in one of the best Republican years ever. If voters got to do it over again today it would be no contest- Alex Sink leads Scott 56-37 in a hypothetical rematch. Independents say they would vote for her by a whooping 32 point margin at 61-29 and even 21% of Republicans now say they'd vote for her, more than twice the 10% level of GOP support exit polls showed her winning in November. Some of the crosstabs in the 'redo' poll point to the Democratic turnout issues that made Scott's victory possible in the first place though. For instance voters under 30 say they would support Sink by a 67-26 margin if the election was today- but those folks made up only 8% of the electorate in the state last year. If they had turned out in greater numbers Scott would have been in the dustbin of Florida political history four months ago. Turnout from African Americans (who say they would vote for Sink now 85-8) and Hispanics (who say they would vote for Sink 69-28) was also down as a share of the electorate last year from 2008. Democratic voters may be disgusted with Scott as Governor but to some extent they did it to themselves by not showing up to vote in November. Scott obviously has almost four whole years to rehabilitate his image but one thing's clear- it's not going to happen if he doesn't change the way he operates. For next week's vote on where we poll we're getting an early start and doing something a little different. There are 18 states that we can poll where we a) haven't polled the 2012 election at all yet and b) don't have a poll coming next week already. So we're putting all of those out there as options and we'll do the top two. Voting's open until Monday afternoon. After we have our winners we'll take suggestions to get into the actual details of what to poll in those states. Have a good weekend! Much has been written about the weakness of the 2012 Republican Presidential candidate field but what I think might be most remarkable about the leading quartet of Mike Huckabee, Sarah Palin, Mitt Romney, and Newt Gingrich is that they've all become more unpopular and by quite a good bit since we started monthly national 2012 polling in April of 2009. The fact that the more Americans are exposed to them, the less they like them certainly does not bode well for their competitiveness next year. -In April 2009 Huckabee's favorability was +8 at 42/34. Now it's -7 at 35/42, for a 15 point drop over the last two years. His net drop has been 25 points with Democrats, 7 points with Republicans, and 19 points with independents. -In April 2009 Romney's favorability was +5 at 40/35. Now it's -12 at 32/44, for a 17 point drop over the last two years. His net drop has been 25 points with Democrats, 18 points with Republicans, and 9 points with independents. -In April 2009 Palin's favorability was -7 at 42/49. Now it's -22 at 35/57, for a 15 point drop over the last two years. Her net drop has been 19 points with Democrats, 18 points with Republicans, and 19 points with independents. -In April 2009 Gingrich's favorability was -8 at 36/44. Now it's -31 at 26/57, for a 23 point drop over the last two years. His net drop has been 20 points with Democrats, 25 points with Republicans, and 33 points with independents. This is a field dying for some new blood...and with even Republican voters souring on their frontrunners there might just be the appetite for it. North Carolina voters aren't responding very positively to the new Republican legislature and if there was an election today Democrats would almost definitely win back some of the seats they lost in November, although it probably would not be enough to get the majority back. 38% of voters in the state have a favorable opinion of the Republicans in the General Assembly, while 39% rate them unfavorably. The key finding there is that independent voters, who gave GOP legislative candidates a 20 point advantage at the polls last year, now rate the new majority negatively by a 37/26 spread. The day before the election last fall PPP found voters in the state planning to vote Republican for the legislature by an 11 point margin at 51-40. That wide spread was what allowed the GOP to not only take the majority in the state House and Senate but do so by a wide margin. Now North Carolinians still say they'd vote for the GOP, but only 45-41. The state's already moved 7 points back toward the Democrats after a couple of months of Republican control. Two key shifts are driving the movement back toward the Democrats. Although independents still say they'd vote Republican by an 8 point margin that's down quite a bit from 20 points in November. And whereas 18% of Democrats crossed party lines to support GOP candidates in the fall, now only 12% say they'd so if they had to vote again today. Some of those more conservative Democrats who were disgusted with their party last year are finding they don't like the alternative very much either. What's driving this move away from the Republicans? They may be over reaching a little bit with some of their legislative goals. For instance we find that 67% of voters in the state are opposed to a bill being pushed by the GOP that would allow concealed handgun permit holders to bring their weapons into parks and restaurants that serve alcohol. Only 23% of voters think it's a good idea. Democrats are predictably the strongest in their opposition (81%) but majorities of independents (57%) and Republicans (54%) are against it as well. This is an instance where the Republicans in the General Assembly are getting a little ahead even of their own party base, not to mention the electorate as a whole. Why do the Republicans still have the generic ballot advantage, even if voters have soured on them somewhat? They still poll better than legislative Democrats, whose favorability is 34/46. Nevertheless it's a good sign for Democrats in the state that things have started to move back in their direction and if it's come this far after just two months of Republican control it definitely seems possible the party could be in a position to retake control of the legislature by next November. Barack Obama won 57% of the vote in Michigan in 2008 but his popularity in the state has fallen a great deal from that level of support over the last two and a half years. Nevertheless he leads his top four potential Republican opponents by healthy margins for reelection because even though he might not be that popular, he's still a lot more popular than they are. 47% of Michigan voters approve of the job he's doing to 45% who disapprove. His numbers with independents are solid, at a 47/42 approval spread. And even though his 4% approval number with Republicans is abysmal it's pretty much par for the course for him around the country. The main reason he's dipped below 50% in Michigan is unusually weak numbers with Democrats- only 78% approve of him to 15% who disapprove. Obama's not likely to win Michigan by his blowout margin of 16 points in 2008 again but if the state voted today he would have an easier time taking it than either John Kerry in 2004 or Al Gore in 2000 did. Mitt Romney does the best of the Republicans against Obama, but still trails 48-41. Mike Huckabee keeps it in single digits as well at 50-41. After the two of them Obama does as well or better than he did last time around- a 16 point advantage over Newt Gingrich at 53-37 and 20 point leads over Sarah Palin at 55-35 and over wild card Scott Walker at 52-32. How can Obama have such wide leads despite such tepid approval numbers? The current Republican crop of candidates just doesn't have much appeal to voters in the state. Despite his considerable Michigan ties only 37% of voters rate Romney favorably to 45% with an unfavorable opinion. He has more Republicans (21%) that dislike him than Democrats (15%) who do like him and you're not going to win as a GOP candidate in Michigan without more crossover support than that. Despite his weak numbers Romney still leads the field in popularity- Huckabee's favorability comes down at 36/45, followed by Walker at 22/37, Gingrich at 27/57, and Palin at 31/61. This is just the latest in a recent line of states where Gingrich's favorability numbers have come out as badly as Palin's, a signal of how weakly he's come out of the gate. Obama could be vulnerable in Michigan for sure. But consider this- despite that weak 78% approval with Democrats, he gets 85-90% of the Democratic vote against each of these five Republicans. There are enough Democrats who don't like Obama that a Republican could get the support necessary across party lines to win the state- it's just far from clear that any of these Republicans could get the support necessary across party lines to win the state. Obama may not win the state by as much as last time but for now Michigan's looking like a second tier swing state. One of the most interesting outcomes of last fall's election results we're seeing in our polling right now is that Republican voters are a lot happier with their own party than they were over the course of last year. Our national poll for Daily Kos this week found 63% of GOP voters approving of Congressional Republicans with 27% disapproving. To put those numbers into some perspective, our final national poll before last year's election found just 44% of Republicans expressing support for their party leadership in Washington to 38% who disagreed. It's not just Congressional Republicans seeing a bump. Our poll for Kos last week found that 75% of Republican voters had a favorable opinion of their party in general, compared to only 16% with a negative one. Those are pretty impressive numbers given that last April we found only 54% of GOP voters liked the direction of their party while 22% dissented. Winning seems to have solved a lot of people's concerns. The big winner in all of this? I think it's establishment Republican politicians. If the GOP base is more content with the party there's likely to be less of a focus next year on taking out incumbents in primaries. Just like the Democratic fever of 2008 was dulled in 2009 and 2010 because the party's voters got fat and happy because of their success, the anger level of Republicans seems likely to be down a notch from 2010. In a twisted way the Tea Party could become a victim of its own success- there just isn't likely to be the same sense of urgency about rooting out moderates in primaries and that sort of thing that there was when the party was completely out of power. And in that sense the calming down of the Tea Party could ultimately work to the GOP's benefit-because it increases the likelihood of a Presidential nominee and nominees in key Senate races that has the ability to win in November. The winners of this week's vote on where to poll were Mississippi and Florida. -What are the general election match ups for Governor that we have to poll...in other words who really has a serious chance of winning each party's nomination? -Doubt any serious Dems are going to challenge Roger Wicker after he dispensed with Ronnie Musgrove but who would you like to see us test? -Any other good questions we should ask in Mississippi. -Who would you like to see us test against Bill Nelson? -Anything else you think we should cover in Florida? -A majority of voters in 26 of the 27 states have a negative opinion of Palin- the only exception is West Virginia where just 47% rate her unfavorably to 41% with a position opinion. -Palin's favorability spread is -20 or worse in 19 of the 27 states we've polled. -There are only three states where Palin's favorability spread is better than -10: in addition to West Virginia they are Nebraska and Montana. -There are eight states where her spread is -30 or worse: in addition to typically blue states like New Jersey, California, Massachusetts, Maine and Rhode Island that includes swing states like Colorado, New Mexico, and Virginia. Bottom line Palin is not a serious general election candidate for President- but she would have a serious chance at the GOP nomination if she ran and that's why we keep polling her. North Carolinians narrowly approve of the job Barack Obama is doing as President and as a result it appears he should once again be very competitive in the state in 2012. 48% of voters like the job he's doing to 46% who disapprove. The key to his solid numbers this month is that he's on positive ground with independents at a 46/43 spread. Voters in the state narrowly like Mike Huckabee, with 42% rating him favorably and 39% unfavorably. As a result he fights Obama to a draw at 45%. A plurality of voters have a negative opinion of all the rest of the Republican candidates and Obama leads each of them. Mitt Romney's favorability breaks down 32/41 and he trails Obama 42-44. Newt Gingrich's is 29/48 and his deficit against the President is 47-42. And Sarah Palin continues to be the weakest potential GOP candidate in the state at 37/57 with an 11 point deficit against Obama at 51-40. The fact that Obama's even money or better to win North Carolina again while Democrats appear to be in dire shape in the Gubernatorial race speaks to how much things are changing in the state's politics. The last time the state went Democratic for President and Republican for Governor was 1896. The only times it elected Republican Governors in the 20th century it simultaneously voted for Republican Presidential candidates by margins of 40 points (in 1972), 24 points (in 1984), and 16 points (in 1988). But it looks entirely possible that the state will elect a GOP Governor next year without winning the Presidential contest at all, much less winning it in the sort of landslide that has previously allowed the party's Gubernatorial candidates to come along for the ride. The biggest beneficiaries of the Midwestern backlash toward newly elected Republican Governors might be the Democratic Senators up for reelection in those states next year. Earlier this month we found Herb Kohl and Sherrod Brown in pretty solid shape for reelection in Wisconsin and Ohio respectively, and now Debbie Stabenow's standing is looking much improved from when PPP last polled Michigan in early December. Stabenow's net approval rating has improved six points to +7 (46/39) from its +1 standing (41/40) in early December. More importantly she now leads all of the Republicans we tested against her by double digits. She's up 10 on former Secretary of State Terri Lynn Land at 48-38, 12 on former Congressman Pete Hoekstra at 50-38, 17 on former state GOP chair Saul Anuzis at 52-35, and 19 on announced candidate Randy Hekman at 52-33. The numbers against Land and Hoekstra are most telling because we also tested them against Stabenow in December. Stabenow is now doing 6 points better against Land, having led by only 4 at 45-41 on the previous poll. And she's doing 11 points better against Hoekstra, having led by just a single point at 45-44 on the original survey. Land is the most compelling of the candidates on the Republican side. She has a 37/19 favorability rating. In addition to being pretty universally well liked within her own party (55/7), she also has very strong numbers with independents (36/19), and comes pretty close to breaking even with Democrats (25/27). With Barack Obama back on the top of the ballot next year Democratic turnout is likely to return to its record levels of 2008 and that means the GOP needs a candidate who can get some crossover votes. Land's chances of doing that appear better than for other Republicans. Hoekstra has pretty similar numbers to Land with Republicans, as 52% of them rate him favorably to 9% with a negative opinion. But his overall favorability scores are not nearly as strong as hers, with voters nearly evenly divided on him at 30% positive and 28% negative. That's because he doesn't have her appeal across party lines- only 13% of Democrats give him good marks to 40% who see him unfavorably and independents are ambivalent toward him, splitting 31/30. Saul Anuzis is probably a lot better known to Washington DC journalists than he is to Michigan voters at this point. Only 20% of voters know enough about him to have an opinion and despite his past service as chair of the state GOP just 6% of Republicans in the state rate him positively. He conceivably could prove to be a good candidate if he ran but at this point he's a blank slate. And the same is true with Randy Hekman who only 17% of voters claim an opinion about. Stabenow's approval numbers still aren't stellar and it would be a surprise if her 2012 reelection proves to be as easy as her 2006 one was- but she's definitely in better shape than at the end of last year. First of all I know many of you have been pining for a Connecticut poll, and we did one for Daily Kos. Check out the results here. -Delaware. One of the states with both a Gubernatorial and Senate race next year that we haven't polled yet. I know you're all dying to see how Christine O'Donnell would do against Tom Carper. -Florida. The Senate race is starting to take shape a little bit more, the Republican primary for President's an important one, and if voters didn't like Rick Scott when we polled in December what do they think now? -Mississippi. Another state that has the trifecta of a Gubernatorial race (open seat), marginally interesting Presidential race (Gallup showed Barack Obama with good numbers in the state in 2010), and a Senate race. Plus is this one of the states enthusiastic about a native son gunning for the White House, or not so much? -New Hampshire. Actually more interested in the general election than the primary here because there's been conflicting polling and we found enough slippage for Obama in Maine that if the same has happened in New Hampshire he's in real trouble. Also interested in seeing if support coalesces around anyone against Romney if you take Huckabee and/or Palin out of the mix. -Vermont. Interested in seeing if Bernie Sanders really has anything to worry about and how voters are responding to Peter Shumlin, given that he has to go right back on the ballot next year. Voting's open for 24 hours, as always don't cheat! We'll do the top two this week. -John Boehner's national poll numbers have already turned negative and on the home front they aren't much better. 37% of voters in Ohio think he's doing a good job as House Speaker to 38% who disapprove. He's popular with Republicans (70% approval) but Democrats aren't giving him any home state bonus (just 10% approve) and independents split against him by a 40/35 margin as well. Although his numbers certainly leave something to be desired they are at least better than Nancy Pelosi's were in California the last time we checked- in September 38% of voters there said they had a favorable opinion of her while 48% rated her negatively. -A majority of voters are withholding any judgment on Rob Portman's performance in the US Senate so far but he's on slightly positive ground with voters who do have an opinion. 25% approve, 22% disapprove, and 53% have no opinion. It's hard to read too much positive or negative into the numbers when there's so much ambivalence but given how bad the numbers for John Kasich and all of the Republican Presidential contenders are in Ohio Portman's looking just fine- keeping a low profile might be the way to go while things are so turbulent in the state. -One politician Ohio voters have much stronger opinions about than Portman- and not in a good way- is Dennis Kucinich. 27% of voters have a favorable opinion of him to 40% with a negative one. Republicans are considerably more unified in their negative feelings toward him (63%) than Democrats are in their positive ones (44%) and independents split against him by a 40/26 margin as well. I guess we'll just have to live without that 2014 Kucinich Governor campaign. -Jim Tressel is still overwhelmingly popular with the Ohio State fan base but it seems likely that his numbers have taken a hit in the wake of the recent scandals surrounding the program. 58% of voters describing themselves as Buckeye fans have a favorable opinion of him to 13% with a negative one. This is the first time we've ever polled on Tressel so we don't have anything to compare it to but college basketball coaches in similarly successful programs like Mike Krzyzewski (77/8 favorability) and Roy Williams (64/3 favorability) have better numbers with their fan bases. I'd imagine Tressel would have been more at those sorts of levels before this controversy. Among all voters in the state and not just OSU fans Tressel's favorability is 43/17. Over the last few weeks we've found that voters in Ohio and Wisconsin have quickly soured on their new Republican Governors, John Kasich and Scott Walker respectively. But Michigan's Rick Snyder wasn't like Kasich and Walker. He campaigned as a moderate and won by 18 points in a state bluer than either Ohio or Wisconsin while his counterparts were just squeaking by in their races. You would think that even if Snyder's popularity has fallen after two months in office it hasn't fallen as far as Kasich and Walker's. Think again. Snyder actually now has the worst numbers of this new trio of GOP Governors, with only 33% of voters approving of him to 50% who disapprove. And despite his overwhelming victory last fall voters now say that if they could do it over they'd pick Virg Bernero over Snyder by a 47-45 margin. Snyder's current status is definitely emblematic of the adage that the higher you climb the farther you fall. What's happened to Snyder? What made him such a formidable candidate last fall was incredibly strong support from independents and an unusual amount of crossover appeal to Democrats. Neither of those things has lasted. His approval with independents is now just 32% with more of them at 44% disapproving. That's a remarkable drop given that our final poll of the race last fall found him leading by 40 points with those voters. He's also down to just a 10% approval with Democratic voters. If there's any silver lining in his numbers it's that he does maintain strong support within his own party- 68% of Republicans approve of him to 13% disapproving. Snyder's ability to win big in a blue state was due to his successfully presenting himself to the voters as a centrist but he's lost that image with a lot of folks over the last few months. In September we found 46% of voters in the state thought Snyder was 'about right' ideologically to only 26% who thought he was 'too conservative.' Now those numbers are basically tied with 37% judging him about right and 36% too conservative. A few specific things are causing Snyder these problems. His signature Emergency Financial Act has been a giant thud with voters in the state. Only 32% of voters support it to 50% in opposition. Democrats are a lot more convinced that it's a bad thing (71%) than Republicans are that it's a good thing (53%), and independents split against it by a 45/36 margin as well. Snyder's also earned the ire of the voters because of the perception that he's targeting collective bargaining rights. 59% of folks in Michigan think that public employees should have the right to collective bargaining while only 32% are opposed, and 49% of voters even favor a state constitutional amendment to guarantee collective bargaining rights while 37% are opposed to such a measure. While union households are obviously the most supportive of collective bargaining, nonunion households support it by a 53/39 margin as well so the voters Snyder is antagonizing on this issue go beyond who you might expect. The one good piece of news for Snyder in this poll is that as far as his stock has fallen, voters don't want to recall him. Only 38% go so far as to say they would support that move, while 49% are opposed. In Wisconsin earlier this month we found voters in the state evenly divided on recalling Walker even though his approval spread of 46/52 was much better than Snyder's. That suggests that even though Snyder has fewer voters standing with him than Walker, the ones unhappy with him aren't as unhappy. That leaves more room for his numbers to recover once things calm down. It's been one rocky start though. Democrats' problems in next year's race for Governor of North Carolina go well beyond Bev Perdue. PPP's newest statewide survey finds that a trio of potential Democratic candidates in the event of a Perdue retirement- Attorney General Roy Cooper, Lieutenant Governor Walter Dalton, and state senator Dan Blue- would all start out trailing presumptive Republican nominee Pat McCrory by a significant margin. This is not a situation where if Perdue decided to step aside her party would all the sudden be even money to hold the Governor's office- the GOP will start out ahead in this race regardless of who the Democratic candidate ends up being. After hitting a high point in December Perdue's numbers continue to slide back in the wrong direction. 30% of voters now approve of her with 52% disapproving, the worst her numbers have been since posting identical figures last August. Perdue's decline since December is across the board rather than coming primarily with one voter bloc- with Democrats she's down from 55% to 50% approval, with Republicans she's gone from 15% to 10%, and with independents her drop is from 26% to 21%. We're seeing Gubernatorial approval ratings across the country plummet in the first part of this year- budget time just does not tend to win Governors a whole lot of friends. Perdue trails Pat McCrory 50-36 this month in a hypothetical rematch of their 2008 contest. Because Perdue's numbers are so poor there's been a lot of speculation about whether she might decide not to run again or whether another Democrat might take her out in the primary. We tested some alternate nominees for the party this month but their prospects don't look great either. Cooper does better than Perdue, trailing by only an 8 point margin at 43-35. But Dalton and Blue each do worse, trailing by 20 point margins at 47-27 and 48-28 respectively. Democrats would be facing an uphill battle with any candidate. Cooper is mostly unknown statewide- 56% of voters have no opinion about him- but his numbers with the folks that do know him are impressive. 27% have a favorable opinion of him to 18% with an unfavorable one and that includes positive numbers with both Democrats (32/17) and Republicans (26/18). Cooper is probably the only politician in the state who has more voters across party lines that like him than dislike him. That appeal to GOP voters is also the biggest reason why Cooper performs better than Perdue against McCrory- he trails by 63 points with Republicans at 75-12 but that's a lot better than her 75 point deficit at 83-8.
Cooper might not be terribly well known but he's a celebrity at this point compared to Blue and Dalton. Only 33% of voters know Blue well enough to have an opinion about him and Dalton's even lower at 31%. 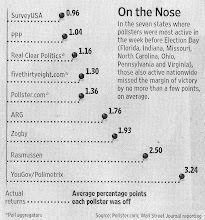 That low name recognition means that their poll deficits are artificially high. 28% of Democrats are undecided in a Blue/McCrory match while only 14% of Republicans are and that gap is even wider for the Dalton match up with 32% of Democrats undecided to only 13% of Republicans. If either of those folks were to become the party nominee the base would likely rally around them and bring these margins a lot closer but make no mistake, they'd still be starting out double digits behind. Right now North Carolinians are ready to elect a Republican Governor for the first time in more than two decades. Democrats' greatest ally is time- there's a long way to go and depending on how the new GOP legislative majority conducts itself over the next 20 months voters may change their minds about whether Republican control of state government is a particularly desirable outcome. If we voted today though there's little doubt McCrory would be elected Governor against anyone the Democrats put forward. We'll have our Michigan and North Carolina polls out starting tomorrow. In Michigan we're leading off with numbers on Rick Snyder and unions...we're seeing the same sort of serious buyer's remorse there as in Ohio and Wisconsin. In North Carolina we'll have our monthly look at Bev Perdue's standing and we also tested to see how some Democratic alternatives to Perdue would fare against Pat McCrory- Roy Cooper, Dan Blue, and Walter Dalton. Where would you like to see us go this weekend? We'll pick some finalists from your nominations and put it to a vote starting tomorrow. At PPP we are looking to hire a new employee whose primary responsibility will be to oversee a lot of our issue polling, which is largely done for private clients. Job duties of the new employee will include working with clients to craft their questionnaires, processing poll data after surveys have been completed to generate properly weighted final results, and communicating poll results to the public through outlets like press releases, media events, and interviews. The new employee will also be expected to work on all other PPP projects as time allows. This is not a 9 to 5 job. Frequent night and weekend hours will be required. If you are interested please send a resume and cover letter to ‘tomj’ at ‘publicpolicypolling.com’ Please no phone calls. The position is open until someone is hired. The salary will depend on background and experience and we offer outstanding benefits.